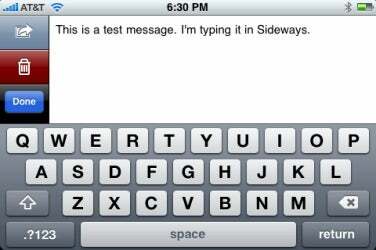 Since Apple released the first iPhone in June 2007, a frequent complaint among users has been the lack of a landscape keyboard in more applications. Users got a taste of this wider, larger-button keyboard in the mobile version of Safari and wished they could use it for text entry in other scenarios. Composing e-mail is easily the most-common example; after all, with the exception of those in the SMS crowd, more typing time is spent in Mail than in any other app. More than a year after that iPhone debut, Apple still hasn’t added such a feature to Mail. But thanks to the App Store, a number of third-party developers have provided workarounds. What all these apps have in common is that they give you a text-entry screen with a landscape-mode keyboard for typing an e-mail message; when you’re done typing that message, you tap a button to switch to Mail, where your message is pasted into the body of an e-mail message. However, the apps differ in features and capabilities. I took a look at six landscape-mode e-mail-composition apps, testing them with the US English keyboard with English as the system language. All support the iPhone’s built-in auto-correct feature; all but one work only with Mail; and none work with the special e-mail messages created by the Photos app for sending photos via e-mail (as those messages are actually created and sent from within the Photos app rather than via Mail). Once you’re done composing an e-mail message in Wide Email, you just tap the Send To Mail button and the message and subject are transferred to a new e-mail message in Mail (where you can further edit the message, if necessary). You then enter an address and send the message from within Mail. You can also use Wide Email to reply to a message or to add text to a forwarded message, although the process requires a few more steps. First, in Mail, you tap on the reply/forward button for a message and then choose Reply, Reply All, or Forward. 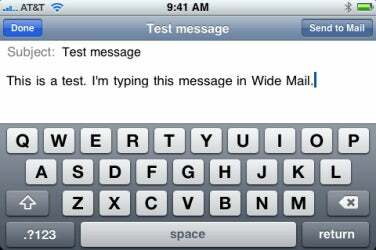 Then you switch to Wide Email, type your reply, and tap Send To Mail; this switches back to Mail and pastes your text into the body of the already-configured message. One caveat here: If you want your reply or forwarded message to retain its subject, leave Wide Email’s subject field blank; if you enter a subject in Wide Email, it will replace the message’s original subject. Alternatively, you can tap the Done button to stop editing. The Done button then changes to Drafts; if you tap Drafts, Wide Email will ask if you want to save your changes, taking you to the list of draft messages. (A simpler approach would be if the developer omitted the Done step altogether, as it’s superfluous.) If you have multiple messages in progress, you can tap one to edit it. You can send a draft message to Mail at any time. If you quit Wide Email in the middle of composing a message, the app automatically saves the message as a draft so you don’t lose your work. One feature I liked is that your sent messages are retained in a Sent Drafts menu on the Drafts screen, making it easy to resend a draft message—or to create e-mail templates that can be used over and over. Unfortunately, you can’t clear sent messages individually; you can only clear the entire Sent Drafts list in one fell swoop. For many users, Wide Email's most useful feature will be Typing Shortcuts, which work much like Mac programs such as TextExpander and TypeIt4Me. You can define textual shortcuts for frequently typed bits of text; whenever a shortcut is typed, Wide Email replaces the shortcut with the corresponding text. For example, if you often include your street address in email messages, you can assign adr as a shortcut for your full name and address; whenever you type adr on its own—in other words, not as a part of a word such as padre—Wide Email will replace those letters with your full address. Depending on your email habits, this feature could dramatically increase your message-typing speed and reduce how much you have to type using the iPhone's onscreen keyboard. It's also a great way to store and insert multiple email signatures. One problem with Wide Email is that if you use an ampersand symbol (&) in a message, when transferring that message to Mail, any text after the ampersand is dropped. The developer is aware of the issue and says it should be fixed in the next version. Despite this ampersand issue, Wide Email is currently my favorite landscape-keyboard email app, in large part because of the Typing Shortcuts feature and the ability to save drafts and to use those drafts as message templates. Sideways automatically saves text if you quit the app. However, what you see in the main text area is what you get—there are no drafts or templates, so you need to clear existing text, using the Delete button, to type a new message. One of the simplest email-composing apps, Compose from The Letter C supports both landscape and portrait modes, but has few features—just a large text-editing field and a button for sending the text to Mail. The text size is small enough that it may be difficult to read for some people, although one advantage to such small font size is that you can view five lines of text in landscape mode and nearly 11 lines in portrait mode. Compose doesn’t provide a subject field or any way of designating part of your message as the subject. 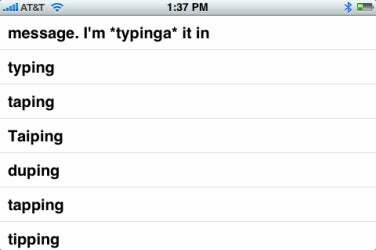 Tapping the Send button—which, confusingly, looks like a Compose/Write button—sends your text to Mail. (As with the other apps, the text is pasted into a new message unless a message or reply is already open, in which case the text is pasted into that in-progress message.) Unfortunately, like Wide Email, Compose exhibits the same problem with the ampersand character: any text after an ampersand is dropped when sending text to Mail. Compose provides no draft or template features, although it automatically saves the current contents of the editing window when you quit the app or send the text to Mail. Frustratingly, I couldn’t find any way to clear the text contents; I had to manually delete text using the backspace key, which can take quite a while with longer messages. Finally, Compose cut off longer messages in my testing. TouchType from Michael Schneider supports both landscape and portrait modes, but adds several other features available via a row of buttons at the top of the screen. This button bar reduces the editing area to four lines of visible text in landscape mode or eight lines in portrait mode. Once you’re done typing your message, you can tap the Send button—which, like Compose’s similar button, looks like a Compose/Write button—to send your text to Mail. (There is no subject field and no way of designating part of your text as the subject of your e-mail message.) As with the other apps here, you can use your text in a reply or forwarded message by setting up that message in Mail first. To create a new message, tap the Clear button to erase the context of the text area. The app automatically saves your text when you quit the app or switch to Mail, and also saves your text every 30 seconds. Like Wide Email, TouchType lets you save multiple drafts/templates. While typing a message (or, if you’re creating a template, after completing it), tap the Save button; a dialog appears confirming the Save. You can cycle through saved text—which is pasted into the text area—by tapping the Load button. However, there are a few issues with this feature. First, if you’ve typed a message but haven’t yet saved it or sent it to Mail, pressing the Load button will replace the unsaved text with one of the saved text bits—it’s gone forever. A warning that you’re about to lose your text would be useful. Second, I couldn’t figure out how to delete a saved bit of text (in other words, how to remove it from the list of saved text bits). Finally, and perhaps most frustratingly, while saved text bits were preserved when I quit TouchType, I found that if I accessed the Settings screen, sometimes TouchType forgot all of my saved text bits. 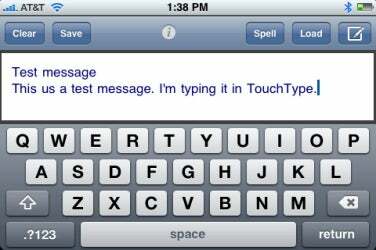 TouchType’s most unique feature—and one that will be compelling for some users—is that in addition to the iPhone’s built-in auto-correct feature, the app includes a separate spellcheck engine that supports 86 different languages. After composing your message, a tap on the Spell button checks the message for misspellings; for each misspelling, the app displays the offending word along with several suggestions for the correct spelling. Tap a suggested spelling to use that spelling; tap the original to keep it. To check spelling in a language other than English, you tap the i button, then tap the Settings button, and, finally, tap the English button to choose another language. One other issue I occasionally experienced was a display glitch where exiting the info/settings screen while in landscape mode would show a portrait-mode screen (in other words, the wide screen would display a portrait-mode screen with unused white space on the right-hand side). Turning the iPhone to vertical would keep the same amount of white space on the right, further shrinking this wrong-size screen. When this happened, I had to quit TouchType and relaunch it to regain the normal view. Like Compose, GP Imports’ Big Keyboard Email (BKE, for short) is very simple—perhaps too simple. Unlike the other apps covered here, it supports only landscape mode. (You can view five lines of text at a time with the default font, although BKE lets you choose smaller text to increase the number of lines, up to seven at a time. Warning: that text is tiny.) A dedicated Subject field lets you enter a subject for your e-mail message, which is transferred to Mail along with your text, replacing any existing subject. Like the other apps, you can use BKE to create a new message or to paste text into a previously prepared reply or forward. A useful feature of BKE is that it warns you if you try to send a message to Mail that has a blank subject or message body; you can turn off this feature in the Settings screen.